Sustainable, organic and biodynamic are the current buzz words coming from wineries across the globe. Wineries and winemakers are making big green strides in the vineyard, as well as the cellar by utilizing these practices. Here’s a bit about all these concepts and what they mean for the wine you’re drinking, particularly what it means when Wine.com calls a wine GREEN. Sustainable can be defined by three main goals – environmental stewardship, economic profitability and social and economic equity. That means that sustainable farmers are doing their best to give back to the environment and to the community, while also furthering their business. Sustainable farming may occasionally use synthetic materials, but only the least harmful and only when absolutely necessary. The goal is a healthy and productive soil that produces healthy vines and will continue to do so for future generations. Most certification organizations cover organic or biodynamic practices only. Because sustainable winegrowing is a broader term, there are less certification bodies for it. A few that do certify sustainable wineries are: LIVE (Low Input Viticulture & Enology) and the just-launched Oregon Certified Sustainable Wine, who promptly displays the tagline “Sustainability is a movement, not a buzz word,” on its landing page. Both are based in Oregon, the state that seems to be leading the sutainable certification process. We do think that more certification bodies for sustainable winegrowing and winemaking will pop up in the future, but at the moment there are not as many as the organic movement. Some sustainable producers I like: Argyle, Benton Lane, Domaine Drouhin, Willakenzie Estate, Willamette Valley Vineyards and Ponzi. Note that some of these producers may not have the green symbol because, while they practice sustainable agriculture, the wines are not specifically certified. Future vintages that do have certification will be green. Organic farming is one step up from Sustainable. 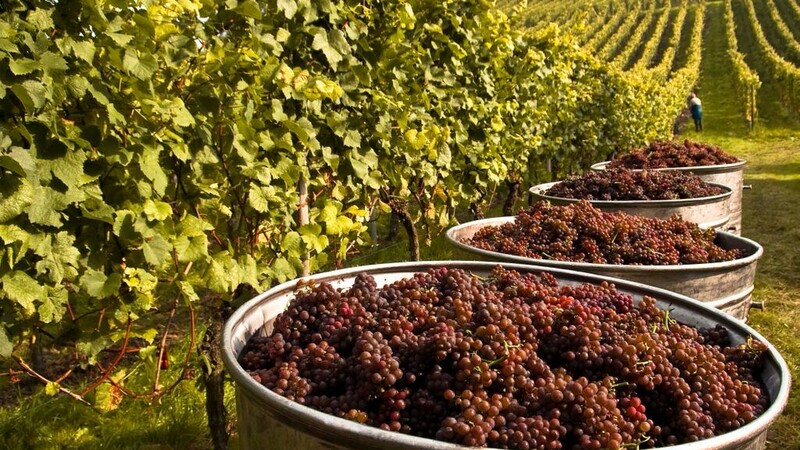 Farmers use no synthetic materials, but rely on natural fertilizers and pest control systems; the winery uses minimal filtration and fining materials and natural yeasts. The key here is excluding the use of any synthetic materials in the vineyard – no fungicides, no pesticides. Instead, crop rotation, cover crops, compost and biological pest control are used for the vines. Most wines termed “organic” are made from organically grown grapes. For a wine to be deemed fully “organic” by the USDA, it must contain no added sulfites. Sulfites act as a preservative, and while most producers using organically grown grapes use sulfites minimially, any addition of them deems the wine unworthy of the USDA’s “organic” label. But there are lots of other organizations other than the USDA that certify organic wines. Some of these organizations include California Certified Organic Foundation and Oregon Tilth. Some US organic producers that are delicious- Frogs Leap, Hagafen Cellars, and Sokol Blosser. Note that Sokol Blosser Evolution is not organic. While trendy now, the biodynamic movement started almost a century ago in the 1920’s. In response to growing concern among European farmers regarding crop vitality in an industry increasingly dominated by chemical materials, Dr. Rudolf Steiner gave a series of lectures presenting the farm as a self-sustaining, living organism that needed to follow the earth’s schedule rather than the farmer’s. In 1928, the organization Demeter was formed. Demeter International is still around today and is the only certifying body for Biodynamic wines. Biodynamic practices use herbs, minerals and even manure for sprays and composts. They also plan vine care and harvesting schedules according to the astronomical calendar. The way Demeter so accurately sums it up: “Biodynamic® agriculture is an ecological farming system that views the farm as a self-contained and self-sustaining organism. Emphasis is placed on the integration of crops and livestock, recycling of nutrients, soil maintenance, and the health and well-being of the animals, the farmer, the farm, and the earth: all are integral parts that make up the whole.” If you look at some of their practices, such as using a spray made from manure buried in a cow horn for a year, it may seem a little hocus pocus, but all you need to do is taste the wines… the end product is usually stellar, and more and more wineries are starting to move towards these practices. A few producers who are certified biodynamic by Demeter USA: Benziger, Bonny Doon, Grgich Hills and Robert Sinskey. While their wineries are certified, not all of their wines are, since some grapes are sourced. We try to be as accurate as possible when calling a wine green so you may not see green symbols next to all these wines. It’s also important to note that there are many organic and biodynamic wineries in Europe who have been practicing this type of farming for decades or longer, but they have not been certified due to the cost or bureaucracy involved. Some of them just don’t see the point – they dont’ care about it for marketing purposes and are just doing what has always made the best wines. Some green folks overseas who are certified include: Vietti, Chateau Beaucastel, Chapoutier, Seresin, Muga and Di Majo. For finding “green” wines at Wine.com, look for our green wine icon. This represents those wineries using one of the above practices. Let us know which vineyards you know of who are practicing being green! We learned alot about green farming on a tour at Benziger. Was really interesting. The wines are really great too. In the recent times, many people prefer to drink healthier wines, which are based on organic wine making methods. It is believed that organic farming techniques have the ability to produce rich and high quality wines with great flavor. The grapes which are grown organically in healthier soils are free from pesticides which results in a good blend of wine. ampelos is one of the first in the US to have all 3 green cert. we are sustainable, biodynamic, and organic – we make our wine and own the vineyard, too! we love to share our passion about this with people and often do vineyard tours to show what the differences are! we are located in Santa Barbara County , Sta. Rita Hills – please check us out!